Unbeknown to many animal advocates, this clause can be used to protect our pets. Under current law, our beloved dogs and cats are considered living property (anathema to most, I know). However, we can use the legal system to file a constitutional challenge against unfair dangerous-dog laws. There are four basic characteristics of breed-discriminatory laws that are relevant: (1) definition of the breed, (2) procedures for identifying and challenging the designation, (3) ownership restrictions imposed, and (4) penalties for violation of the laws. Many laws have been found unconstitutional because they failed to provide adequate procedural due process protections for citizens. Breed-discriminatory laws are impractical and expensive and do nothing to enhance public safety. If a canine profiling ordinance is enacted, the government has the burden of proof, which means that they have to prove the dog is of a certain heritage. For unregistered dogs or for dogs of unknown origin, this is problematic. For criminal measures, the government must prove that the dog in question is of a certain origin beyond a reasonable doubt. If there are civil penalties, the government has the burden of proving that the canine is of a certain heritage by a preponderance of evidence. In the past, this was done with visual identification, but with the advent of scientific advances — namely, DNA testing — that is changing. DNA testing is considered to be a much more reliable way to prove a dog’s heritage and has been used to save pets who were put on death row because of their appearance. However, DNA testing is expensive. It may cost around $160 a dog, something that most local governments don’t anticipate having to pay for. In addition to citing the expense involved in proving a dog’s heritage, advocates need to use the numerous studies that have been published to show that breed-discriminatory laws are not rationally related to public safety. Studies from the United Kingdom, Spain and Germany have revealed that bites do not decrease with the implementation of breed restrictions. 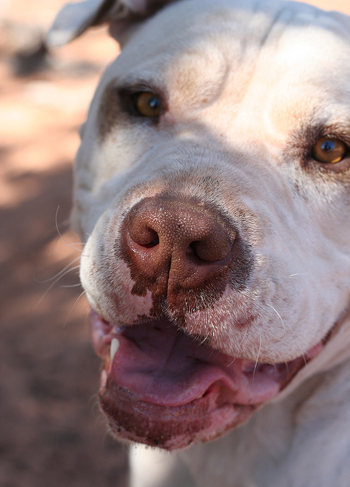 You can find links to many of these studies on the Best Friends’ Pit Bull Initiative website. In the United States, Topeka, Toledo and Cleveland recently repealed their breed-discriminatory ordinances not only because they were expensive, but because they were also ineffective. 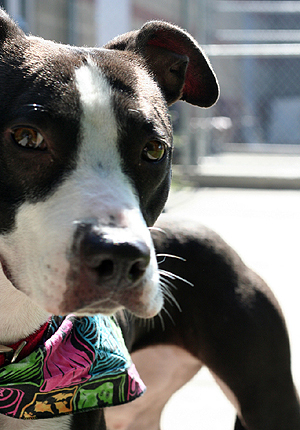 To help grassroots activists, Best Friends Animal Society commissioned a study entitled “The Fiscal Impact of Breed Discriminatory Legislation in the United States.” The economic research firm John Dunham and Associates estimated that there are over five million pit-bull-terrier-type dogs in the United States. According to the study, if the United States were to enact a breed-discriminatory law, it would cost almost $460 million to enforce annually. To cite a single community, the fiscal cost of a breed-discriminatory law in the District of Columbia is estimated at almost $966,000 annually. That’s a huge chunk of change in a time when communities are laying off teachers, police and firefighters. Click here to find out how much money officials in your community would waste if they enacted breed restrictions. In this austere economy, all taxpayers should rebel against any government contemplating enacting a breed-discriminatory provision. If there is already one on the books, citizens should actively lobby for repeal. •	Call or write your city council members and let them know that breed-discriminatory laws are ineffective and expensive, and tell them why. •	Ask your veterinarian, groomer and friends to also call or write to their city council members. 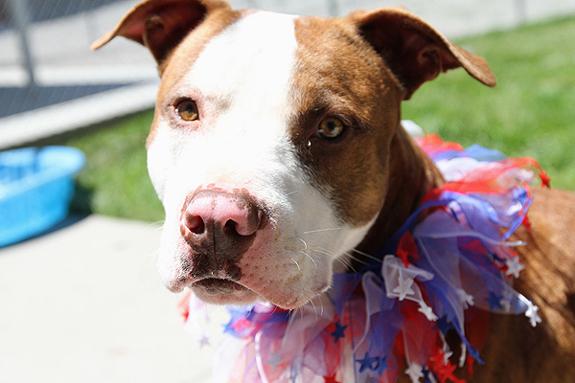 •	Show up at city council meetings and speak out against breed discrimination. •	Start a petition drive on Change.org and have folks send an e-mail to the decision makers. In addition to the e-mail option, Change.org also lets you collect signatures online and download them to present personally to government officials. Publicize your Change.org petition through Facebook and Twitter. •	Hit the road and put up flyers in veterinary offices and at groomers’ businesses. Don’t forget the local barbershop, beauty shop or bar — places that politicians frequent. You can also contact Best Friends Animal Society and ask for help in getting the word out through Voices for No More Homeless Pets. You can sign up to join by clicking here. To read the article called “Fiscal Bite & Breed Discrimination: Utilizing Scientific Advances & Economic Tools in Lobbying,” click here. For more tools to use to lobby to Save America’s Dog, click here. A tea party for pets? Seriously? Don’t bring ridiculous politics into a forum for pet lovers of all walks of life. Who thought this was a good idea and…does that same person want to risk alienating those of us who frown upon the separatist antics the Tea Party has brought to our political system? The Tea Party itself did not bring separatist anything ….. it was American’s standing up for American right’s …… And if we don’t STAND FOR OURSELVES THEY WILL HAVE US KNEELING FOR EVERYTHING !!!!!!! @KoryLarson Oh please….just what in the world were you being made to “KNEEL” regarding? @CreoleInDC UMMMMM…BDL to start!!! Folks being told what breed of dog we can or cant have, some even having their dogs ripped away from them and killed… or does that not constitute as being made to kneel at the demands of government in your book? I live in a city where we are considered CRIMINALS for “Owning an inherently vicious or potentially dangerous dog” BASED ON THE DOGS BREED ALONE. Antics? While I am personally not a Tea Party member, the only “Antics” I see here are coming from folks who will claim to be “alienated”. @USMC WIFE 73 And how exactly is that a tea party issue? I’m sure there are Republicans as well as Democrats who feel the exact same way. Don’t bring politics into a true cause we can all support wholeheartedly. Maybe they mean “tea party” as in a little party… Lol, & not Tea Party? @CreoleInDC The title was meant tongue in cheek and its intent was not to support any political party. Our goal was just to point out that any BDL legislation should not be tolerated anyone, regardless of their political views. @USMC WIFE [email protected] Please take this article for the information that it contains, and don’t focus on the title, which was written tongue in cheek. We are just supporting abolishing BDL, not any political parties, because we feel people from all parties should not support discrimination of any kind. I agree with USMC WIFE 73…… If any government or form of government has inherent tyrant power in any area of life then you are being made to KNEEL….. and as far as I can tell we quit KNEELING to any kingdom when we became the UNITED STATES OF AMERICA !!!!! We should never tolerate such bias ….. it has tarnished our shine….. and we are a NATION OF COMMUNITY’S THAT SHINE !!!! BDL …… Is inherent tyrant power ……. the facts show the bias ……. and the very reason they get away with enforcing this is because we do not stand up …… there is no breed that is more dangerous than another ……. What in fact there are ….. is owner’s who are less responsible and that is the true root of the problem !!!!! I have never seen a MEAN PITBULL that was not made mean by it’s owner !!!!! sorry let me clarify ……. a mean pitbull that was not first MADE mean BY it’s owner !!!!!! Sarge was a good example of the love dogs carry ……. 12 yrs. of abuse and being forced to fight and he still LOVED !!!!! I have two exotic birds, and when the bird flu started going around and being such a problem in S. California they started talking about maybe rounding up birds “for safety” I said it then about my birds and I will say it again now about my dogs. Anyone who thinks they are going to come onto my property and take my animals from me without just cause (and a stupid law is not) had better be very well armed. I am not a violent person but you do not mess with my family. @Mike in DHS Thanks Mike, we completely understand your feelings about wanting to protect your pets. @DianeEkern Again, as we said before, it was a tongue in cheek title, not a specific reference to the actual Tea Party. I have read the comments and Stubby Dog’s replies before posting, but I still find the use of the label “Tea Party” to be off-putting and offensive. We have no harbor handy to toss dried leaves in, these laws were imposed on us by our “elected representatives” not some foreign power. The association in the public’s mind of “Tea Party” with lunatic fringe, impossible demands, rigidity and an inability to work together toward a common goal does not help our message.